When Angelique Kidjo emerged onto the Chan stage in her vivid red and yellow blazer and red head wrap, I could see that she was petite, but there was nothing diminutive about her powerful voice or athletic energy. Kidjo was jumping, gliding, and strutting to the lively beats that her backup quartet provided with their bass, guitar, percussion instruments and drum kit. Kidjo called out at the fourth song, “You ready for a party?” and by then some audience members were starting to spontaneously move down the aisles to dance closer to the stage. When she launched into Petite Fleur, she dedicated the song to Malala Yousafzai, the Pakistani girl who was recently shot by a Taliban gunman. “I don’t believe in any religion that kills,” she told the audience and then went on to say that she wants to use music as a weapon of peace. 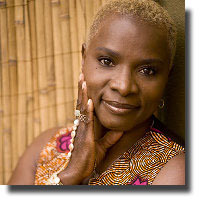 Toward the end of the concert, Kidjo came off the stage and wandered around the orchestra floor, shaking the outstretched hands of people in the audience before she invited those who were dancing in the aisles to join her up on the stage. During the rousing double encore of Pata Pata and Batonga, I counted more than thirty people dancing joyously on stage, while everyone else was out of their seats, clapping loudly to the hypnotic conga beat and Kidjo’s impassioned singing. Exactly as she had evoked us to do, we were celebrating life!